First baseman Paul Goldschmidt will don a new MLB uniform for the first time in his career. The Arizona Diamondbacks officially announced a deal that will send Goldschmidt to the St. Louis Cardinals for catcher Carson Kelly, pitcher Luke Weaver, minor league second baseman Andrew Young and a 2019 competitive-balance Round B draft pick. Goldschmidt, 31, has been voted to six straight All-Star Games. In 2018, he hit .290 with 33 homers and 83 RBI, his fourth season in the past six years with at least 30 homers. But while Goldschmidt continued to rake, the Diamondbacks failed to meet expectations, finishing 82-80 and third in the NL West. That was a major regression from the 2017 campaign, when Arizona went 93-69 and reached the postseason. In the wake of the letdown year, the Diamondbacks opened for business, even for teams interested in Goldschmidt, the face of the franchise. Goldschmidt not only provides solid pop at the plate and excellent defense at first base, but he's also on the hook for just $14.5 million in 2019, which is strong value for a player of his impact. He will be a free agent after that, however. For the Cardinals, Goldschmidt will further improve an offense that finished fourth in the NL in homers last season (205) and sixth in runs (759). It will also allow the club to move Matt Carpenter to third base on a full-time basis, giving the Cardinals one of the best infield corner duos in baseball. And with that pair solidifying the middle of the lineup, the Cardinals should once again be a threat in the NL Central after they missed the postseason the past three years. Goldschmidt's addition is a huge one for St. Louis before it attempts to chase down the Milwaukee Brewers and Chicago Cubs next season. Weaver is the most established big leaguer going back to Arizona. The 25-year-old is coming off a down season with a 4.95 ERA in 30 appearances, but he showed a lot of potential in 2017 with a 3.88 ERA and 72 strikeouts in 60.1 innings. Kelly has struggled in three brief cups of coffee over the past three seasons. He's posted a .154/.227/.188 slash line in 63 career games. The former second-round pick has tremendous upside—he began 2018 ranked as the No. 71 overall prospect in MLB by ESPN's Keith Law. "Kelly is already better than a typical major league backup but has the upside to be a star if he can make better quality contact ... and if he gets the chance to play," Law wrote. The Cardinals aren't hurting at catcher with Yadier Molina entrenched behind the plate, so Kelly was an expendable piece for them. Kelly won't have any problems getting on the field with the Diamondbacks, whose backstops combined to hit .189/.270/.319 last season. Young, 24, has hit at every level in the minors after being a 37th-round draft pick in 2016. He posted a .289/.379/.479 slash line in 119 games across two levels last season. 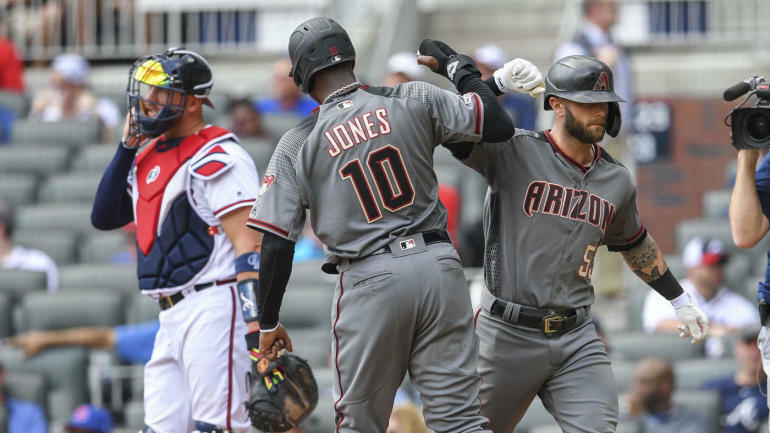 Even though the Diamondbacks lost their franchise player in the deal, their return has the potential to be strong and provide immediate returns. Weaver and Kelly should start 2019 in the big leagues. Young may get more seasoning in Triple-A, but a midseason call-up wouldn't be a stretch.